It was last week when the sad news came down that Robin Gibb had passed away at the age of 62 after a long illness. I always liked the music of the Bee Gees, but that turned into something else altogether when I was introduced to their early work during the garage/mod days. I’m old enough to remember some of the Bee Gees pre-disco radio hits but when a friend suggested I pick up their first album, oddly enough entitled ‘Bee Gees 1st’ my mind was good and truly blown. I already knew tunes like ‘To Love Somebody’ (covered countless times), ‘Holiday’ and ‘New York Mining Disaster 1941’ all of which turned up on oldies radio from time to time, but I had no inkling of the groups popsike side. Songs like ‘In My Own Time’ and ‘Every Christian Lion Hearted Man Will Show You’ and ‘Red Chair Fadeaway’ combined the brother’s already formidable pop songwriting talent with the lysergic flavor of the times. While they rarely crossed over into the heavy side of things, neither were they too far into the twee, ‘toy shoppe’ sound. 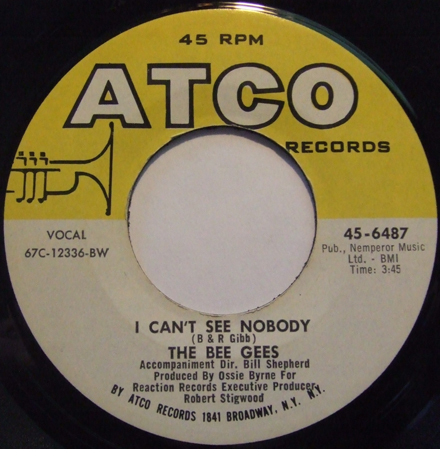 The thing that is often overlooked (aside from the fact that most people are unaware that they even existed prior to ‘Staying Alive’) is that during their early years on Atco, the Bee Gees were an actual band, with Barry on guitar, Maurice on bass, Vince Melouney on lead guitar and Colin Peterson on drums. Their first three albums – ‘1st’ (1967), ‘Horizontal’ (1968) and ‘Idea’ (1968) – are all remarkably good and worth digging into (not too hard to find either). 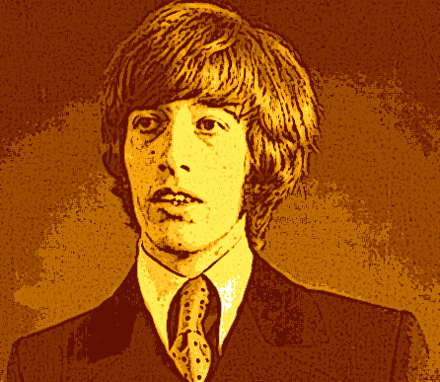 Robin Gibb was a crucial part of the Bee Gees sound, both as a unique vocalist and as composer, co-writing many of the groups best songs with Barry and/or Maurice. A few years back, when the box set of these three albums – ‘The Bee Gees: The Complete Studio Albums 1967-1968’ complete with mono and stereo mixes, rarities and outtakes – was released, I spent a great deal of time listening to it strapped into the headphones. I mention that last part because if you really want a serious taste of the Bee Gees (especially Robin) as vocalists, you need to isolate and dig deep. When you listen to their records on the radio, the wide open vibrato in Barry and Robin’s voices is obvious, but what usually hits you is the power of their harmonies. If you listen intently to a song like the first of the two selections I bring you today (my fave Robin vocal) ‘I Can’t See Nobody’*, it’s striking what an unusual voice he had. As odd as it sounds, Robin Gibb was quite a soulful singer. This is not say that he was going to give Otis Redding anything to worry about, but rather that he had clearly been listening to singers like that, and while all three brothers fall in line as a unit in harmony sections, as a soloist Robin was something special. The second song I bring you today is from the brief period in 1969 when the group fractured (reportedly in a conflict over who’s song would be released as a single) and Robin Gibb went out on his own. He had a UK Top Ten hit with his solo single ‘Saved By the Bell’, and released an accompanying album (‘Robin’s Reign’) later that year. 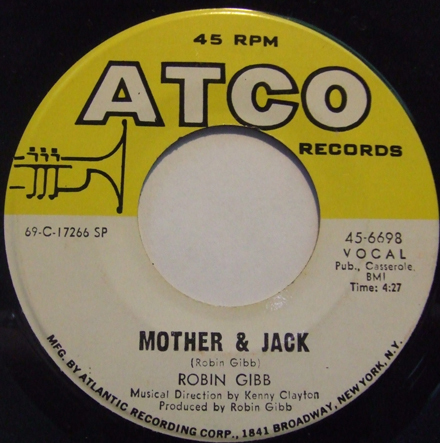 ‘Saved by the Bell’ was a sweeping ballad, but its flipside, ‘Mother and Jack’ is by far the more interesting record. Opening with a drum machine (credited to Robin), the song – which has a lighthearted melody but concerns a mother and her child being evicted from their home – is a great slice of pop. Interestingly enough, ‘Mother and Jack’ was not the initial b-side of ‘Saved By the Bell’. The earliest copies of the single were pressed with the song ‘Alexandria Good Time’ on the flip, but then withdrawn and destroyed. The song has never seen official issue and is only available on bootlegs. You can hear it on YouTube. I hope you dig these songs, and if you haven’t dug the early Bee Gees, pick up those first three albums (or the boxed set if you can still find it). I hope all is well on your end of the digital stick. I should get things started by letting you in on something many of you probably already know, that being that in the history of the music known as rock, there was more than one band calling themselves The Knack. This is one of them (heh…), the first in fact, who trod the stages of southern California during the mid-60s when all was a-jangling on the ole Sunset Strip. Aside from the thinnest bit of connective power-poppery, they bear no relation to the band of the same name that hit the charts (with a dull thud) more than a decade later with ‘My Sharona’. This Knack was (as mentioned) a SoCal band that recorded four 45s for Capitol between 1966 and 1968. They were, like many bands of the day – but moreso than many of their geographical contemporaries – soaked liberally in the sounds of the UK. 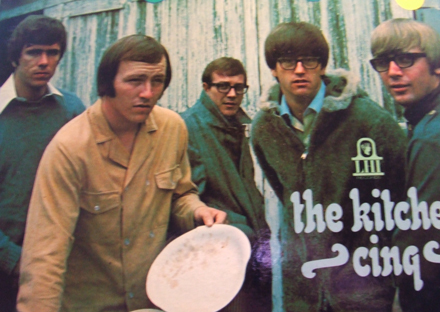 Featuring Dink Kaplan, Mike Chain, Larry Gould, Pug Baker (and after Kaplan’s departure Bobby Cochran), the Knack were originally called the InMates. The group played all of the big clubs on the Sunset Strip. 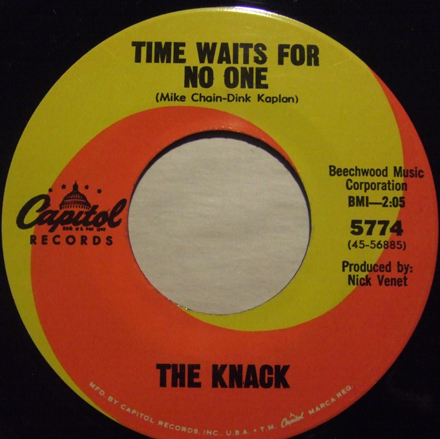 After they were signed to Capitol (and produced, at least for their first two 45s by Nick Venet) the Knack went out on the road, playing live all over the US and appearing on local TV shows around the country. ‘Time Waits For No One’ was the A-side of their debut 45 in January of 1966. While it has all the jangle and pop goodness of the Strip, it also has (as does its flip side) a fairly large dose of Hollies-style sounds as well. In an era where countless bands settled for heavy handed, simplistic delivery, the Knack laid down a sophisticated and complex sound. 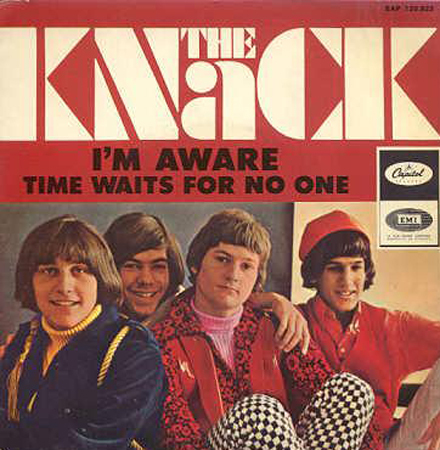 Unfortunately, despite their obvious musical talent, the Knack ended up lost in the tidal wave of quality music cresting at the time, eventually washed away by same. Eventually Mike Chain ended up “becoming” Pinkiny Canandy for one excellent album on the UNI label (check past episodes of the Iron Leg Radio Show for some of their music). Had Doug Feiger and his pals never reared their head in the late 70s, it’s possible that the original Knack might be much (or at least a little) better known than they are, instead of a confusing Google search result, which is how things kind of ended up. NOTE: I just heard the Doug Dillard had passed away at the age of 75. I thought I’d repost this great song that first appeared here back in 2008. I’m back following the long holiday stretch, hoping that you all dug the last podcast and are ready for more goodness. On the podcast tip, as I stated in the last post I have a very cool mix in the hopper that will probably drop in this space next week. It’s something that I’ve been cooking for a long time and it finally came together during December, so stay tuned. Today’s selection is a very nice bit of country/folk/rock by one of the more interesting and influential groups of the 60’s. The Dillards came got their start in the early 60’s primarily as a bluegrass band. They came to fame via appearances as the fictional Darling family on the Andy Griffith show between 1963 and 1966. The Southern California country rock scene included number of former bluegrass musicians, like Chris Hillman and Clarence White of the Byrds and David Lindley of the Kaleidoscope. The Dillards became a huge influence on this scene, with Doug Dillard playing on the seminal country rock LP ‘Gene Clark with the Gosdin Brothers’, after which Dillard & Clark were formed and recorded two albums for A&M. Just before this period, when the Dillards were first exploring electric instruments and fusions of country, folk and rock they recorded the LP ‘Wheatstraw Suite’. Back when I was a kid, and reading everything I could get my hands on about rock music, ‘Wheatstraw Suite’ was often cited as an important album in the creation of country rock. This has always been an especially interesting period for me, not only because I’m a fan of the sound, but because the musical history often contradicts the conventional wisdom on the subject. While some would have you believe that country rock got its start with the likes of the Eagles, there were numerous examples of formative instances of the genre years before the members of that particular band started hating each other’s guts. The earliest “major” group working in the genre was of course the Byrds, recording electrified versions of straight country – like Porter Wagoner’s ‘Satisfied Mind’ – on their early albums. There were also efforts by the Monkees (mainly Nesmith influenced), International Submarine Band (featuring early work by Gram Parsons), Nitty Gritty Dirt Band, Rick Nelson and of course the band that Chris Hillman would form with Gram Parsons, the Flying Burrito Brothers*. On “Wheatstraw Suite” the Dillards were working a lot more on the country/folk side of the street, but there is a definite pop thread running through the entire album, with covers of tunes by the Beatles (‘I’ve Just Seen a Face’), Tim Hardin (Reason to Believe) and Jesse Lee Kincaid of the Rising Sons** (‘She Sings Hymns Out of Tune’ which was covered around the same time by Harry Nilsson). Today’s selection ‘Lemon Chimes’ was recorded in a different version prior to the ‘Wheatstraw Suite’ album and released as a 45 (the version you’re hearing today is from the LP). The tune was written by the drummer on this session, Dewey Martin who went on to play with the Buffalo Springfield. Interestingly enough, that 45 was produced by none other than David Axelrod during the Dillards very brief (two singles) sojourn at Capitol Records following which they re-signed with their longtime label, Elektra. Though I haven’t heard that earlier version, I love the rerecording on the LP, where the Dillards managed to create a unique fusion of countrified Sunshine Pop. Listening to the tune it’s hard to imagine that the group performing it were a straight bluegrass band but a few years before. *Interestingly enough two of these groups contributed members to the Eagles, with bassist Randy Meisner coming from Rick Nelson’s band and Bernie Leadon coming from the Flying Burrito Brothers. What you see before you is a truncated version thereof, bringing it in at a little bit under an hour. Times are a little harder than normal these days so I don’t have quite as much time to get things together as I normally do. I’ll go back to the longer format as soon as time allows. This month you get some interesting stuff, including a couple of great, obscure slices of pop and a set from one of my favorite groups, Thom Rapp and Pearls Before Swine. As always, I hope you dig it, and I’ll be back next week with more cool stuff. The tune I bring you today is the product of oneof those semi blind purchases, i.e. a band/record that is only vaguely familiar, contains most of the mid-60s/garage signifiers (cool cover versions etc) and part of a very interesting label. The band in question is the Kitchen Cinq. Hailing from Texas, and having morphed into their 66/67 recording outfit from a few earlier bands, they managed to find their way to California and into the clutches of the storied Lee Hazlewood, producer Suzi Jane Hokom and LHI records. I had never seen a copy of the record until I was down spinning soul 45s at the Washington DC record fair and my man DJ Birdman (with whom I share garage revival roots) pulled the LP out of his sale box and waved it under my nose. I took all of the aforementioned evidence into account, unfurled my bankroll and took the disc home. When I finally managed to slip it under the needle I was pleased by the mixture of folky-garage-isms, leanings toward more commercial pop and a couple of cover versions that I’d pick up no matter who was recording them (i.e. I Can’t Let Go etc). The tune I bring you today is my favorite cut from the album, the band’s cover of Buffy Ste Marie’s ‘Codine’. Though the song was covered many, many times, the version I always find myself going back to is the plodding and exceptionally groovy take by the Charlatans. The Kitchen Cinq take a more propulsive approach to the song, adding a nice helping of fuzz guitar as well. Of all the tracks on the album, ‘Codine’ comes the closest to having that ‘garage 45’ feel. 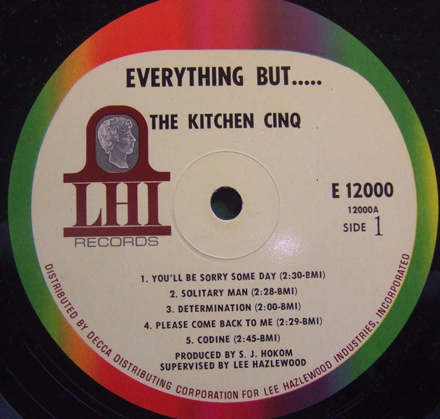 The Kitchen Cinq managed not only their album but a number of non-LP 45s for LHI, which like just about everything else on the label is fairly hard to come by. None of their material has been reissued either.